​The Loyal Dispense​​​​r Program is simple. You get free dispensers, free installation, free maintenance, and a no-nonsense lifetime guarantee on the dispensers. Then we provide you with conveniently delivered supplies at low, competitive rates. Loyal dispensers are specifically designed to be convenient while saving you money. Hands-free dispensers come in either manual or automatic, and both provide outstanding portion control. Our dispensers are sanitary low touch or no touch systems that help with infection control, helping to improve facility hygiene. Enjoy easy, quiet operation with durable construction and no-rust components for long, dependable service. Every dispenser comes with a lifetime guarantee so you will never need to pay for repairs. 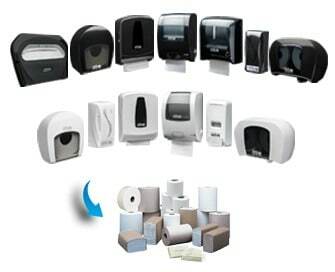 Choose black or white dispensers in stylish, upscale designs that help your business maintain a quality reputation and image.